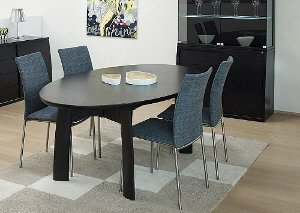 The new dining table SM71 combines beauty and functions in an innovative design – simple and elegant with curved lines. The table has the shape of an ellipse. The profile of the tabletop is sharp with soft and slightly rounded edges. The oval legs of the table also have strict lines, but at the same time a curved shape adding a beautiful and unique dimension to the table. The table SM71 has a synchronous extension system with two leaves in a storage compartment. The table seats six persons and fully extended it will seat ten. Some assembly required. Chairs shown, SM58 available by Special Order, contact store to inquire.